This comment from former UK Finance Minister, Ken Clarke, aptly summarises the uncertainty facing companies, investors and individuals as we look ahead to the 2018 – 2020 Budget period. None of us have ever seen a situation like today’s. 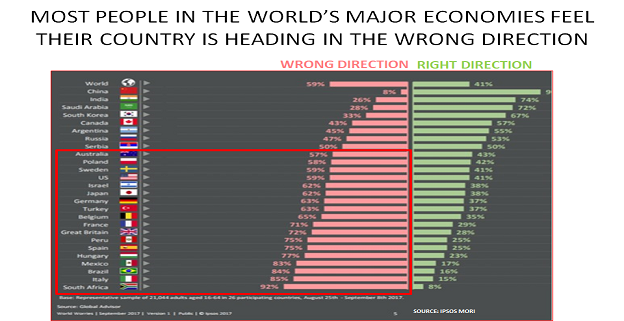 Even worse, is the fact that risks are not just focused on the economy, or politics, or social issues. They are a varying mix of all of these. And because of today’s globalised world, they potentially affect every country, no matter how stable it might appear from inside its own borders. This is why my Budget Outlook for 2018 – 2020 is titled ‘Budgeting for the Great Unknown’. We cannot know what will happen next. But this doesn’t mean we can’t try to identify the key risks and decide how best to try and manage them. The alternative, of doing nothing, would leave us at the mercy of the unknown, which is never a good place to be. 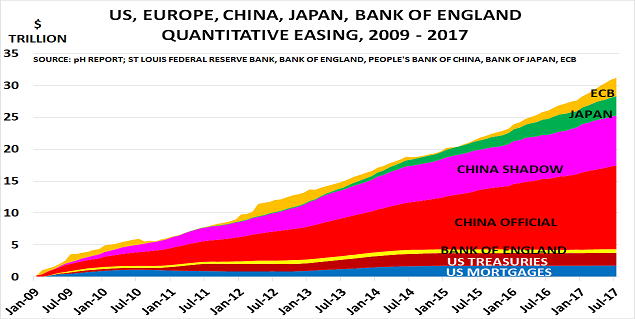 China is, of course, most at risk – as it was responsible for more than half of the lending bubble. This means the health of its banking sector is now tied to the property sector, just as happened with US subprime. Around one in five of all Chinese apartments have been bought for speculation, not to be lived in, and are unoccupied. • Who is now going to replace them as buyers of government debt? 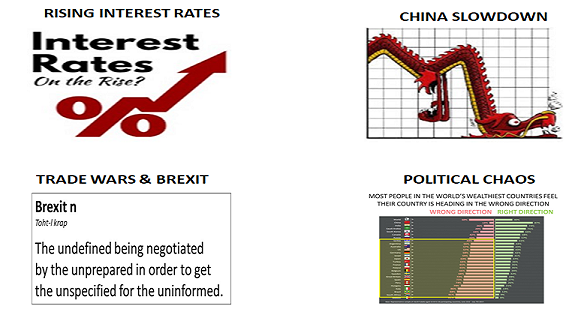 • And who is going to buy these bonds at today’s prices, as the banks back away? There is only one strategy to manage this risk, and that is to avoid debt. Companies or individuals with too much debt will go bankrupt very quickly if and when a Minsky Moment takes place. After 2008, it seemed everyone wanted to believe that China had suddenly become middle class by Western standards. And so they chose to ignore the mounting evidence of a housing bubble, as shown in the chart above. As a result, average house price/earnings ratios in cities such as Beijing and Shanghai are now more than 3x the ratios in cities such as New York – which are themselves wildly overpriced by historical standards. China will therefore no longer be powering global growth, as it has done since 2008. Prudent companies and investors will therefore want to review their business models and portfolios to identify where these are dependent on China. This may not be easy, as the link to end-user demand in China might well be further down the supply chain, or external via a second-order impact. For example, Company A may have no business with China and feel it is secure. But it may suddenly wake up one morning to find its own sales under attack, if company B loses business in China and crashes prices elsewhere to replace its lost volume. 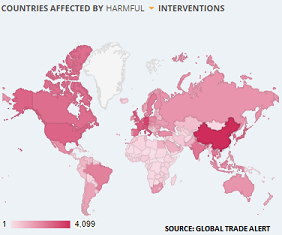 Trade policy is the third key risk, as the chart of harmful interventions from Global Trade Alert confirms. These are now running at 3x the level of liberalising interventions since 2008, as Populist politicians convince their voters that the country is losing jobs due to “unfair” trade policies. China has been hit most times, as its economy became “the manufacturing capital of the world” after it joined the World Trade Organisation in 2001. At the time, this was seen as being good news for consumers, as its low labour costs led to lower prices. But today, the benefits of global trade are being forgotten – even though jobless levels are relatively low. What will happen if the global economy now moves into recession? No family tries to grow all its own food, or to manufacture all the other items that it needs. And it used to be well understood that countries also benefited from specialising in areas where they were strong, and trading with those who were strong in other areas. But Populism ignores these obvious truths. “There are several poison pill proposals still on the table that could doom the entire deal,” Donohue said at an event hosted by the American Chamber of Commerce of Mexico, where he said the “existential threat” to NAFTA threatened regional security. At the moment, most companies and investors seem to be ignoring these developments, assuming that in the end, sense will prevail. But what if they are wrong? It seems highly likely, for example, that the UK will end up with a “hard Brexit” in March 2019 with no EU trade deal and no transition period to enable businesses to adjust. Today’s Populist politicians don’t seem to care about these risks. For them, the allure of arguing for “no deal”, if they can’t get exactly what they want, is very powerful. So it would seem sensible for executives to spend time understanding exactly how their business might be impacted if today’s global supply chains came to an end. This suggests there is major potential for social unrest and political chaos if the elites don’t change direction. Fear of immigrants is rising in many countries, and causing a rise in Populism even in countries such as Germany. “Business as usual” is always the most popular strategy, as it means companies and investors don’t have to face the need to make major changes. But we all know that change is inevitable over time. And at a certain moment, time can seem to literally “stand still” whilst sudden and sometimes traumatic change erupts. At such moments, as in 2008, commentators rush to argue that “nobody could have seen this coming“. But, of course, this is nonsense. What they actually mean is that “nobody wanted to see this coming“. The threat from subprime was perfectly obvious from 2006 onwards, as I warned in the Financial Times and in ICIS Chemical Business, as was 2014’s oil price collapse. 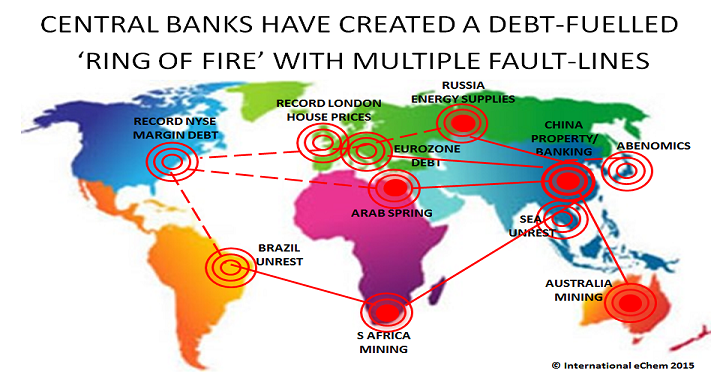 Today’s risks are similarly obvious, as the “Ring of Fire” map describes. We can all hope that none of these scenarios will actually create major problems over the 2018 – 2020 period. But hope is not a strategy, and it is time to develop contingency plans. Time spent on these today could well be the best investment you will make. As always, please do contact me at phodges@iec.eu.com if I can help in any way. The post Budgeting for the Great Unknown in 2018 – 2020 appeared first on Chemicals & The Economy.